Indian hockey badly needs a Perestroika to regain its former glory. Many would ask what the economic policy adopted in the former Soviet Union has got to do with India’s national sport. If Mikhail Gorbachev’s step in 1986 became the unintended catalyst for dismantling of the totalitarian state, why can’t Indian hockey’s system of governance be reformed? At the highest level, it is temperament that separates the men from the boys, and today a 19-year-old became a man at the one-day level,” said Sunil Gavaskar about Suresh Raina, the doughty teenager from Ghaziabad, after he scripted India’s victory against England at Faridabad. Raina, who made his debut against Sri Lanka in July last year after good performances in the 2004 Under-19 World Cup as well as in domestic cricket, won applause from former England players like Nasser Hussain and Graham Gooch, besides the British media. With his superb knocks at Faridabad and Goa, Suresh Raina is all set to become a vital member of the Indian one-day team. If Viswanathan Anand is the king of chess, she is virtually the queen, or to be precise, the princess. In the latest FIDE rating list, 19-year-old Grandmaster Koneru Humpy has maintained her position as the world number two among women and the world number one among junior girls. Despite her unexpected failure in last month’s Women’s World Chess Championship in Ekaterinburg, Russia, where she was knocked out in the second round, Humpy gained 11 Elo points which took her tally to 2,548. Ethiopia’s Kenenisa Bekele completed a historic double by winning the men’s 12 km title at the World Cross Country Championship in Fukuoka (Japan) on April 2, only to announce he won’t be back. Indian hockey badly needs a Perestroika to regain its former glory. Many would ask what the economic policy adopted in the former Soviet Union has got to do with India’s national sport. If Mikhail Gorbachev’s step in 1986 became the unintended catalyst for dismantling of the totalitarian state, why can’t Indian hockey’s system of governance be reformed? It may not be prudent to compare the erstwhile Soviet empire to Indian hockey, but one cannot help finding amazing similarities. Any dissent was silenced in the USSR. Things are hardly different in the Indian Hockey Federation (now Confederation). The authorities do not take the blame for any failures or flaws in the system. Debacles in international competitions are always blamed on coaches or players. Has the top brass ever owned responsibility for the downslide we have witnessed over the past few decades? By sacking chief coach Rajinder Singh Jr, the confederation has made him a scapegoat, holding him responsible for the team’s poor show in recent times. Victimising both players and coaches is nothing new for the Indian hockey body. Big names like Prithipal Singh, Balbir Singh (Railways), Dhanraj Pillay, Baljit Dhillon, Mukesh Kumar, Gagan Ajit Singh, Cedric D’Souza, Pargat Singh, Rajinder Singh Sr and Rajinder Singh Jr have all suffered. Intriguingly, those who follow the sport or have been closely associated with it have been accepting decisions taken by a few without a murmur. Are coaches and players alone to be blamed for India’s poor performances in international hockey? Can the confederation be absolved of its responsibility? Back in 1976, when the then IHF chief, Dr MAM Ramaswamy, named Aslam Sher Khan as captain of the Indian team for an invitation tournament in Lahore, Prithipal Singh resigned as Chairman of the Selection Committee as he was not consulted before finalising the team. It was Prithipal who had earlier quit Punjab Police, joined Northern Railway, and fought his way back into the Indian team for the 1964 Olympics following a spat with the then bosses of Indian hockey. Incidentally, Prithipal, who refused to play as a halfback in New Zealand prior to the Tokyo Olympics, helped India win the Olympic gold medal with his lethal penalty-corner shots. After the present set-up, with KPS Gill as President and K. Jyothikumaran as Secretary, took over the reins of Indian hockey, hopes were raised of a revival. Cedric D’Souza was named the national coach. He got a free hand, worked hard on the boys but results eluded him. He got the sack midway during a tournament in Malaysia. It set a bad precedent peculiar to Indian hockey. Virtually every year we get a new coach. In the past seven years, we have seen several come and go. After Cedric left, Vasudevan Bhaskaran, Col Harcharan Singh, Pargat Singh, Rajinder Singh Sr and Rajinder Singh Jr, also made an unceremonious exit. Before Rajinder Jr there was a German coach, Gerhard Rach, who too left sulking, pointing the finger at the IHF top brass. Now Rajinder Jr has given full vent to his feelings, blaming the IHF Secretary for the sorry state of affairs. History is repeating itself too often in Indian hockey. And the ultimate sufferer is the game itself. At the highest level, it is temperament that separates the men from the boys, and today a 19-year-old became a man at the one-day level,” said Sunil Gavaskar about Suresh Raina, the doughty teenager from Ghaziabad, after he scripted India’s victory against England at Faridabad. Raina, who made his debut against Sri Lanka in July last year after good performances in the 2004 Under-19 World Cup as well as in domestic cricket, won applause from former England players like Nasser Hussain and Graham Gooch, besides the British media. Former captain Hussain said: “Raina’s innings was a gem, and his timing on both sides of the wicket was better than any other player. He seems to have come of age.” Gooch was impressed by two of his signature strokes — a thump over mid-on against Andrew Flintoff and a scoop over fine leg — and said these would be frozen in memory for long. Indian cricket has discovered a new hero, he added. The British media was not behind in praising Raina. Describing the 19-year-old as a “frightening potential”, it went on to suggest that his coming of age would ease India’s despair at life after Sachin Tendulkar. Raina might have made a forgettable start to his one-day career — he was declared leg before wicket on the very first ball he faced — but he will remember his Faridabad innings for many reasons. This was not only his first one-day half century (81 from 89 balls) but also a match-winning knock, which helped India recover after being reduced to 92-5. Before entering the national squad, Raina made his presence felt in the Under-19 World Cup held in Bangladesh in 2004. He scored 247 runs in seven matches, including a whirlwind 90 not out off 38 balls against Scotland, and also picked up five wickets. He was the second highest run scorer for India in the tournament after Shikhar Dhawan. Raina also captained the Uttar Pradesh under-16 team and toured with the under-17 team to Sri Lanka and later with the under-19 side to England. Due to his excellent performances with both bat and ball at the junior level, he was selected for training at the Australian Cricket Academy in Adelaide under the Border-Gavaskar Scholarship. That stint improved his back-foot play. Raina went to England in April, 2005, and had a successful outing in league cricket in Lancashire. He played for the Manchester-based Astley & Tyldesley Cricket Club and displayed great form, scoring 865 runs in 12 matches, including four centuries, and also grabbed 32 wickets. Raina made his debut for Uttar Pradesh in the Ranji Trophy in 2002-03. In the 2005-06 season, he emerged as a star for UP. His 620 runs in six games propelled Uttar Pradesh to their maiden Ranji Trophy title victory. In the final against Bengal, Raina supported his captain Mohammad Kaif and struck half centuries in both innings (90 and 52). But despite his excellent performances at various levels, Raina is still known as a one-day player. Though he was inducted into the Test side for the Nagpur Test against England last month, he failed to make it to the playing eleven. But the way he has performed against England in one-dayers, he deserves a chance in Test cricket. Raina’s all-round credentials make him a valuable asset, given his sharp fielding and miserly off-spin bowling. India captain Rahul Dravid has predicted that Raina could be the player of the next decade. With some senior players on the wane and the selection policy focusing on youth, Raina can become an integral part of the Indian team sooner than later. If Viswanathan Anand is the king of chess, she is virtually the queen, or to be precise, the princess. In the latest FIDE rating list, 19-year-old Grandmaster Koneru Humpy has maintained her position as the world number two among women and the world number one among junior girls. Despite her unexpected failure in last month’s Women’s World Chess Championship in Ekaterinburg, Russia, where she was knocked out in the second round, Humpy gained 11 Elo points which took her tally to 2,548. She is ranked second in the world behind Judit Polgar of Hungary, who has topped the women’s list with an Elo rating of 2,711 points (The rating system is named after the man who formulated it — Arpad E. Elo). Among girls, she holds the record of being ranked number one 16 times. Her Elo rating is also the highest ever achieved by a junior girl. Born on March 31, 1987, in Gudivada, near Vijayawada (Andhra Pradesh), Humpy was originally named Hampi (champion) by her father Koneru Ashok, but he later changed the spelling to give the name a Russian flavour. As her first coach, he introduced her to the game when she was just five years old. The rest, as they say, is history. She has won four world championship titles so far — junior girls, under-10, under-12 and under-14. In May, 2002, she achieved her third GM Norm during the Elekes Memorial Grandmaster Tournament in Budapest. At the age of 15 years, one month and 27 days, she became the youngest woman to become an International Grandmaster. 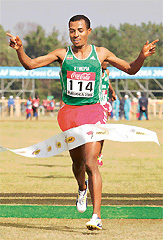 Kenenisa Bekele has reigned supreme at the World Cross Country Championship over the past five years. The 23-year-old twice IAAF athlete of the year became the first man to win both the 4 km and 12 km titles five years in a row following his triumph in the shorter race on April 1. Bekele, the Olympic and world 10,000 metres champion, broke away from his closest rivals with a powerful finish in the 12 km race, crossing the line in 35 minutes 40 seconds at Fukuoka’s seaside course. He then declared he would probably not run at another World Cross Country Championships. Bekele, who has set world records in the 5,000m and 10,000m in the past two years, took his tally of track, indoor and cross country titles to 18. “I want to step aside and make way for my young Ethiopian team-mates,” said Bekele, who won his first indoor world title by winning the 3,000m in Moscow last month. The Ethiopian’s win in the long course race also matched the achievement of Kenya’s Paul Tergat, who won the 12 km title at the championships five years running from 1995. The Indian men’s hockey team disappointed fans yet again with a poor show at the Commonwealth Games in Melbourne. The team lacked coordination, speed, stamina, skill and penetration. The defence was also very weak. Rajinder Singh Junior’s men simply do not have enough firepower to excel in a major competition. The team seemed to be playing with little planning as was evident from the few penalty corners earned by them. The Indian team still needs intensive training to match the speed and stamina of Pakistan, Australia and European teams like Holland and Spain. The Indian hockey team finished a poor sixth at the Commonwealth Games. India have performed badly in all major international tournaments held in recent times. The Indian Hockey Federation (IHF) is responsible for the decline of Indian hockey. There is too much chopping and changing of players as well as coaches. Senior players are not treated with dignity. They are included in the team for one tournament, but are dropped for the next. Kudos to Harbhajan Singh for scripting India’s 39-run victory against England in the first one-day international at New Delhi. Harbhajan was deservingly declared the man of the match. He not only took five wickets but also made 37 runs — the highest score for India in the match. His knock were largely responsible for India crossing the 200-run mark. With this performance, Harbhajan has also silenced his critics, who were calling for his ouster. South Africa created history by successfully chasing Australia’s mammoth total of 434 in the final ODI of the series. They registered a stunning one-wicket victory with one ball to spare, bludgeoning a world record 438 for nine. Bowlers from both sides were severely punished. Even then Aussie pacer Nathan Bracken claimed five for 67. However, his compatriot Mike Lewis conceded a world record 113 runs. The pitch at Johannesburg, where Australia raised a monumental 359 against India in the 2003 World Cup final, again proved to be batsmen’s paradise and bowlers’ graveyard. Pitches of this type do not bode well for aspiring and promising bowlers. Anyway, the gladiatorial battle between Aussies and Proteas will remain etched forever on the memory. Indian batsmen put up a dismal performance in the Mumbai Test against underdogs England, which helped the visitors to win the match and square the series. Most of the Indian batsmen played in an irresponsible manner. To make matters worse, big names like Sachin Tendulkar and Virender Sehwag played despite not being fully fit. Both Sachin and Sehwag were guilty of keeping their own interests above that of the team.